In biomagnification the concentration of the persistent toxins (crosses) increases higher up the food chain. In this scenario, a pond has been intoxicated. As we go further into the food chain, the toxin concentration increases, causing the top consumer to eventually live off intoxication. Biomagnification is the build up of toxins in a food chain. The DDT concentration is in parts per million. As the trophic level increases in a food chain, the amount of toxic build up increases. The x's represent the amount of toxic build up accumulating as the trophic level increases. Toxins build up in organism's fat and tissue. Predators accumulate higher toxins than prey. Biological magnification often refers to the process whereby certain substances such as pesticides or heavy metals work their way into lakes, rivers and the ocean, and then move up the food chain in progressively greater concentrations as they are incorporated into the diet of aquatic organisms such as zooplankton, which in turn are eaten perhaps by fish, which then may be eaten by bigger fish, large birds, animals, or humans. The substances become increasingly concentrated in tissues or internal organs as they move up the chain. Bioaccumulants are substances that increase in concentration in living organisms as they take in contaminated air, water, or food because the substances are very slowly metabolized or excreted. Although sometimes used interchangeably with "bioaccumulation", an important distinction is drawn between the two, and with bioconcentration. Bioaccumulation occurs within a trophic level, and is the increase in the concentration of a substance in certain tissues of organisms' bodies due to absorption from food and the environment. 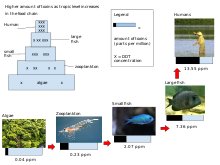 Biodilution is also a process that occurs to all trophic levels in an aquatic environment; it is the opposite of biomagnification, thus when a pollutant gets smaller in concentration as it progresses up a food web. Lipid, (lipophilic) or fat soluble substances cannot be diluted, broken down, or excreted in urine, a water-based medium, and so accumulate in fatty tissues of an organism, if the organism lacks enzymes to degrade them. When eaten by another organism, fats are absorbed in the gut, carrying the substance, which then accumulates in the fats of the predator. Since at each level of the food chain there is a lot of energy loss, a predator must consume many prey, including all of their lipophilic substances. For example, though mercury is only present in small amounts in seawater, it is absorbed by algae (generally as methylmercury). Methyl-mercury is the most harmful variation of mercury. It is efficiently absorbed, but only very slowly excreted by organisms. Bioaccumulation and bioconcentration result in buildup in the adipose tissue of successive trophic levels: zooplankton, small nekton, larger fish, etc. Anything which eats these fish also consumes the higher level of mercury the fish have accumulated. This process explains why predatory fish such as swordfish and sharks or birds like osprey and eagles have higher concentrations of mercury in their tissue than could be accounted for by direct exposure alone. For example, herring contains mercury at approximately 0.01 parts per million (ppm) and shark contains mercury at greater than 1 ppm. DDT is thought to biomagnify and biomagnification is one of the most significant reasons it was deemed harmful to the environment by the EPA and other organizations. DDT is stored in the fat of animals and takes many years to break down, and as the fat is consumed by predators, the amounts of DDT biomagnify. DDT is now a banned substance in many parts of the world. In a review, a large number of studies, Suedel et al. concluded that although biomagnification is probably more limited in occurrence than previously thought, there is good evidence that DDT, DDE, PCBs, toxaphene, and the organic forms of mercury and arsenic do biomagnify in nature. For other contaminants, bioconcentration and bioaccumulation account for their high concentrations in organism tissues. More recently, Gray reached a similar substances remaining in the organisms and not being diluted to non-threatening concentrations. The success of top predatory-bird recovery (bald eagles, peregrine falcons) in North America following the ban on DDT use in agriculture is testament to the importance of biomagnification. There are two main groups of substances that biomagnify. Both are lipophilic and not easily degraded. Novel organic substances are not easily degraded because organisms lack previous exposure and have thus not evolved specific detoxification and excretion mechanisms, as there has been no selection pressure from them. These substances are consequently known as "persistent organic pollutants" or POPs. Metals are not degradable because they are elements. Organisms, particularly those subject to naturally high levels of exposure to metals, have mechanisms to sequester and excrete metals. Problems arise when organisms are exposed to higher concentrations than usual, which they cannot excrete rapidly enough to prevent damage. Some persistent heavy metals are especially dangerous and harmful to the organism's reproductive system. ^ Landrum, PF and SW Fisher, 1999. Influence of lipids on the bioaccumulation and trophic transfer of organic contaminants in aquatic organisms. Chapter 9 in MT Arts and BC Wainman. Lipids in fresh water ecosystems. Springer Verlag, New York. ^ Suedel, B.C., Boraczek, J.A., Peddicord, R.K., Clifford, P.A. and Dillon, T.M., 1994. Trophic transfer and biomagnification potential of contaminants in aquatic ecosystems. Reviews of Environmental Contamination and Toxicology 136: 21–89. ^ Gray, J.S., 2002. Biomagnification in marine systems: the perspective of an ecologist. Mar. Pollut. Bull. 45: 46–52.